Washington Redskins coach Jay Gruden said as of Monday afternoon, he had not yet talked to owner Dan Snyder or anyone else in the organization about his future or the jobs of his coaching staff. ASHBURN, Va. (AP) — The Washington Redskins’ constantly changing personnel reminded cornerback Josh Norman of a game show. There were plenty of new and unfamiliar faces for Washington this season. Despite racing out to a 6-3 start behind a strong defense and the steady play of quarterback Alex Smith, the Redskins eventually placed a league-high 24 players on injured reserve — including Smith and his backup, Colt McCoy, both of whom suffered broken legs — while losing six of their final seven games to finish 7-9 for the second straight season. 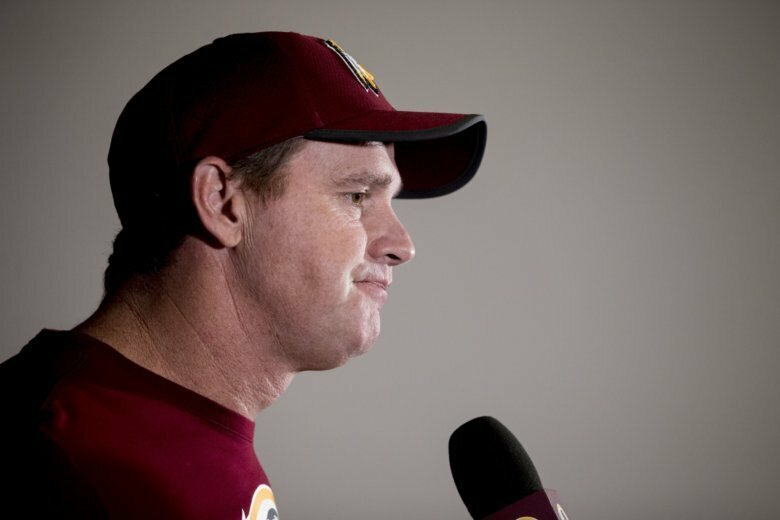 Coach Jay Gruden said as of Monday afternoon, he had not yet talked to owner Dan Snyder or anyone else in the organization about his future or the jobs of his coaching staff. Gruden said he didn’t want to use injuries as an excuse, but added that it was “impossible” to fully evaluate his players, particularly at quarterback, where the Redskins had four different starters. They finished the season with Josh Johnson, who had last started an NFL game in 2011. Washington has missed the playoffs in three consecutive seasons and in four of Gruden’s five years in charge. Gruden is the longest-tenured coach since Snyder bought the team in 1997, compiling a 35-44-1 record. Uncertainty surrounds veterans Norman, Jamison Crowder, Jordan Reed, Mason Foster, Zach Brown and Adrian Peterson, among others. Peterson, the 33-year-old running back picked up on Aug. 20 to help ease the loss of second-round draft pick Derrius Guice to injury, was one of the bright spots for the Redskins. He led the team with 1,042 yards rushing and seven touchdowns. “I only can control the things I can control and I felt like I’ve done that somewhat, so I’ll sit back and let the chips fall where they may,” Peterson said about his future. As for Smith, there’s no guarantee the 34-year-old quarterback will ever play again after he suffered a compound fracture that required multiple surgeries and a long hospital stay to fight off an infection. The Redskins acquired Smith in a trade with Kansas City after allowing Kirk Cousins to leave in free agency. Team president Bruce Allen infamously said after the 2014 season the Redskins were “winning off the field.” They had their fair share of problems once again in that department. The Redskins, who are 59-84-1 in Allen’s nine years on the job, finally acknowledged the end of their decades-long sellout streak as crowds continued to dwindle at FedEx Field. They also received harsh criticism for singing free agent Reuben Foster following his arrest for domestic violence, placed second year safety Montae Nicholson on the non-football injury reserve list following a late-season arrest, released Pro Bowl alternate D.J. Swearinger on Christmas Eve after Swearinger repeatedly complained about defensive coordinator Greg Manusky, and fired several business executives on Dec. 26 after less than a year on the job. Somehow, Washington was still in playoff contention until a Week 16 loss at Tennessee. The Redskins concluded the season with a 24-0 loss to the Philadelphia Eagles that felt like a road game as traveling Philly fans nearly filled up the lower bowl at FedEx Field. As to Norman’s future with the team as a player — or contestant, as he put it — the once-coveted cornerback felt that he was better than his three interceptions showed.